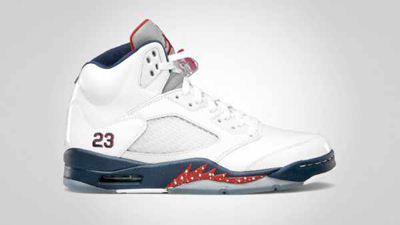 Since its release during the American Independence Day, Jordan Brand is still enjoying the success of the patriotic edition of the Air Jordan 5 Retro. Dubbed as the “4th of July” edition, the Air Jordan 5 Retro is currently available in the market in White/Varsity Red – Midnight Navy colourway and is absolutely making waves in the market. The new Air Jordan 5 Retro features a white leather upper that is accented with Midnight blue midsole and lining along with a red flame on the midsole. Don’t have this in your collection? Grab one now and you’ll never regret it! Another Jordan 6-17-23 Hitting the Market Today!